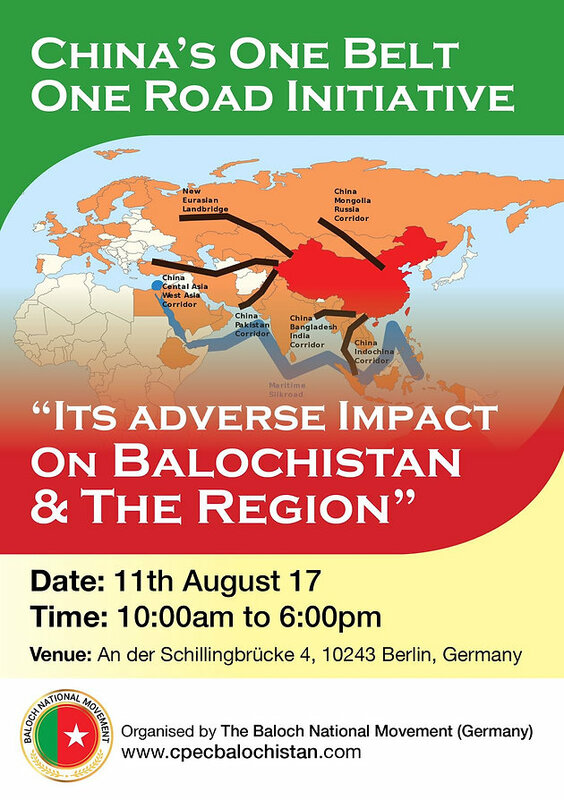 (Daily Sangar) Baloch National Movement (BNM), organized a one-day conference titled “China's One Belt One Road Initiative; Its adverse impacts on Balochistan and the region”, in the capital city of Germany on 11 August 2017. Noted experts on international affairs and south Asian regional geopolitics from around the world participated in the conference and shared their views on the theme. The event was moderated by Ms. Laurie Deamer, a leading human rights activist from the United States. BNM’s international representative, Mr. Hammal Haider, delivered the opening address and welcomed the guests. The conference was divided into three sessions. In the first session, eminent speakers-- German researcher and security observer Dr. Siegfried O. Wolf, regional security expert from Afghanistan, Mr. Ehsan Monnawar, security analyst from India, Mr. Alok Bansal, and strategic expert and analyst from Japan, Mr. Shunichi Fujki— shared their perspectives on the theme with the audience. The speakers in the second session were, President of UNPO, Naser Buledai, Convener of MQM in London, Nadeem Nusrat, noted Baloch author and researcher, Dr. Naseer Dashti, General Secretary of the World Uyghur Congress, Mr. Dolkun Isa, President of the World Sindhi Congress, Lokko Lohana, BNM’s representative in North America, and Dr. Zafar Baloch. The third session was addressed by Chairman of the Human Rights Council of Balochistan (HRCB), Mr. Taj Baloch, President of Baloch Republican Party, Germany Chapter, Mr Jawad Baloch, and Foreign Committee Organizer of the Baloch Students Organisation-Azad (BSO-A), Niaz Baloch. The sessions focused on change in the global strategic environment, the state of Chinese economy, the relevance and impact of CPEC, and growing strategic presence of China in different parts of the world and its implications for regional and global security. Mr. Hammal Haider Baloch, in his opening remarks, said that the local population of Balochistan was being converted into a minority in its own land because of the unabashed colonization taking place in the state in the name of “CPEC”. He held that this project was for military and strategic purposes, and the economic content of it was meant to serve the interest of the colonisers rather than the people of Balochistan. The project, he said, would start a cold-war in the region by seeking to change the existing balance of power in the region. This had serious implications for global security, he concluded. Dr Siegfried O. Wolf said that, the OBOR project was supposed to connect Asia and Europe. The CPEC, as a flagship project of OBOR, was a controversial project between Islamabad and China, about which local people were kept largely unaware and their needs and interests were being ignored. This project, he said, was meant to extend military outreach of China in the region. As far as OBOR was concerned, it is meant to boost Chinese exports at a time when Chinese economy was undergoing severe stress due to global economic slow-down. The Chinese plan, he said, could harm Germany’s financial interests, in the long run. Chinese products have started displacing German goods in the markets and would make Germany dependent on China in future, he observed. Dr Zafar Baloch dwelt on the importance of the day, "11th August", on which the conference was being held, and told the audience that it was an extraordinary day because, seventy years ago on this day in 1947, the Baloch people achieved their freedom and they remained free only for the next 227 days because the Pakistani army attacked and occupied Balochistan on 27 March 1948. Jinnah forced the then ruler of Balochistan, the Khan of Kalat, to accede to Pakistan and carried out an brutal military offensive to suppress a popular movement, which opposed this move. The national resistance movement of the Baloch people has been going on since that day, he said. Today, after the announcement of the CPEC, with China's help, human rights violations are on rise. He regarded CPEC as a Chinese strategy aimed at military expansionism in the region. He indirectly mentioned the fact that apart from the military forces, Pakistan army has unleashed the radical Islamist and jihadi groups on the innocent Baloch people. He said that Balochistan is home to a million Zikri people who believe in Sufism and Balochistan, as a whole, is proud of its secular tradition and spirit of tolerance. However, today they are the targets of Pakistani jihadi groups funded and enabled by the military of Pakistan. Thus, the project was a matter of life and death for the people of Balochistan, he concluded. Mr Ehsan Monnawar said that Afghanistan was the heart of Asia and owned several trillion dollars of resources, but the new democratic Afghanistan was facing a bad situation due to external interference of neighbours, especially Pakistan. He said that the world knew quite well that Afghanistan had been in a state of war for the past four decades and the neighbouring country, Pakistan, was sheltering terrorists. When Russia attacked Afghanistan, Afghanistan managed to defeat the Russians, but the people of Afghanistan were still struggling to achieve peace, because Pakistan made it impossible for Afghanistan to overcome the challenge of terrorism by funding and sheltering terrorist group in its soil. He held, that Pakistan was nurturing ISIS and using it against the people of Balochistan and Afghanistan. By turning Gwadar into a military base with Chinese help through CPEC, Pakistan is ensuring its strategic hold over the entire coast and the connecting overland route and denying Afghanistan, a landlocked country, access to the sea. Mr. Alok Bansal said that, the OBOR project would economically affect Europe more than others. He said that India was the only country that did not join the project. Raising a legal and constitutional issue, he held that Gilgit-Baltistan, which provided the critical connecting link to the CPEC, was not a part of either Pakistan or China, because the area was not mentioned in the Constitutions of both the countries. Same was the case of the so called ‘Azad’ Kashmir. India's Constitution clearly mentioned the area as part of its territory. In such a situation, it was illegal on the part of both Pakistan and China to build CPEC through its territory without consulting India. Bansal further said that, when the leader of the Baloch Nationalist Party (BNP), Ataullah Mengal was told that Gwadar would become another Karachi, he retorted: “Those who are building Gwadar as Karachi, are willing to eliminate the Baloch nation." There is no Baloch working on the Gwadar Port project. People in China were not being allowed to keep fast on Muslim religious occasions and are forced to shave beards, but the same Chinese are being welcomed by an Islamic state to build connectivity infrastructure in Pakistan. This was an anachronism and it could only be possible because of a strategic nexus between the two. He held that the people of Pakistan were not aware of the long-term implications of the CPEC. He cited the example of Chinese investments in Sri Lanka and said that China constructed the Hambantota port in Sri Lanka, which was not commercially viable. When Sri Lanka was asked to repay the loan, which went into the making of the port, it could not return money to China. Sri Lanka was compelled to hand it over to China and lease away 15000 acres of adjacent land to China for 99 years, to develop it as a commercial township. The real intention of China is to expand its strategic footprint in the Indian neighbourhood. He said that this was being replicated in Gwadar and Pakistan would face the brunt of it later. According to him, the CPEC had unsettled regional strategic balance and made the region more insecure than it was earlier. Mr. Shunichi Fujki said that no one knew about Balochistan in Japan and got to know about it only after obtaining information about CPEC and agreed with other panelists that it had a negative impact on regional security. Mr. Naser Buledai said that Pakistan and Iran were using the name of Islam politically to suppress the genuine nationalist movement in Balochistan. Human rights violations were at their peak in Balochistan and nobody was taking notice of it. He said that Pakistan was using the Islamic card and provoking the Baloch people to target Chabahar Port, which India was constructing to access Afghanistan and Central Asia. Pakistan backed Lashkar-e-Khurasan of ISIS is active in Eastern and Western Balochistan, he said. Mr. Lakoo Lohana of the World Sindh Congress said that the Baloch and Sindhi nations faced a critical existential challenge. In 21st century, when all human beings were supposed to live freely in their native land in their own way, the people of Balochistan and Sindh were being denied that right by the state of Pakistan. He said that Sindh generated seventy percent of Pakistan's resources and was home to the only port of consequence in Pakistan, i.e., Karachi. But seventy percent of the people of Sindh living were living below the poverty line. “Pakistan does not need the people of Sindh but its resources and the land”, he said. Both the Sindhis and the Baloch people were facing oppression, cruelty and slavery and the CPEC was going to increase their problems as Pakistan army is eager to provide utmost security to the Chinese and enhance its deployment in these states. Mr. Nadeem Nusrat said that Karachi port was being expanded and Gwadar will become another Karachi. Religious proxies were being created in Balochistan to unleash a reign of terror on the innocent people there. It is exactly the same tactic Pakistan had adopted in Karachi for a long time. He said that the Muhajirs were, like the Baloch, the most secular of all people in Pakistan and MQM was the most secular of all the mainstream Pakistani political parties. However, the muhajirs were suffering at the hands of ‘rangers’ for the last four years, while the jihadis were allowed to hold rallies, collect money and distribute pamphlets openly. Pakistan Army and Intelligence agencies were helping them, while MQM offices were forcibly shut down. The same tactic was also being adopted against the Balochi people and the process would only intensify because it was natural for the Baloch people to oppose CPEC and Pakistan had decided to do everything possible to provide security to Chinese projects in future. Echoing Dr Zafar Baloch’s statement, Dr Naseer Dashti said that CPEC was a matter of life and death for the Baloch and the Sindhis. “If there is CPEC, there will be no Baloch”, he said emphasizing the contradictions further. He argued that Gwadar Port was planned to be built in the 1990s but could not be built because of western resistance. However, after 9/11, when relations between Pakistan and the West worsened because of the support provided by the Pakistani agencies to the Taliban, Pakistan thought seriously in terms of deepening relations with China as an alternative and invited the latter to implement the project. He said that Pakistan has planned to settle thousands of people along the corridor to provide protection to these projects. Ninety percent of lands around Gwadar, he said, had already been provided to the Army and people from Punjab. About two million people have already been forced to flee Balochistan and settle outside Balochistan in different parts of the world. There is a plan to settle more than three million other people in Balochistan and reduce Baloch to a minority in their own land. After a few decades, the Baloch will be effectively pushed out of Balochistan. He also regretted that the Balochi language was on the verge of extinction and all the Baloch political parties were being severely suppressed by the army. He supported the argument that Pakistan had created many religious extremists in Balochistan to suppress Baloch nationalist spirit. Security agencies were also backing drug mafias and extremists in return for their cooperation in persecuting the people of Balochistan, and curbing the ongoing freedom movement there. Uyghur activist, Dolkun Isa, said that the first victims of the CPEC were the Uyghurs because it started from Xinjiang, their native land. China had enslaved the Uyghurs and was bent on wiping out their language, culture and religion. The same was going to happen to poor Baloch people as CPEC would be implemented, he opined. Talking about the Human Rights violations in Balochistan, Mr. Taj said that his institution has access to only 25% of Balochistan, which made the information base very limited. Even then, he averred, the scale and magnitude of violations were too large not to attract the attention of the world. He informed a shocked audience that all the villages on the CPEC route were being systematically destroyed and depopulated. Through targeted military operations, the army forced the locals to migrate and villages after villages were being besieged by armed forces and the males of the villages were being forcibly arrested and eliminated. “The cases of forced disappearance in Balochistan has assumed grave proportions and it is strange that the conscience of the international community remains unaffected”, he said. According to his information, in 2005, the army abducted BSO-Azad leaders who went missing for one year. The "kill and dump" policy started in 2009 and it has taken a new shape today. The Pakistani army abducts people and keeps them in dungeons for weeks, months and years, where they are tortured and then killed and their bodies are handed over to hospital administration or local authorities with the claim that they were terrorists and killed in encounters. Teachers and disabled people are also not being spared. He urged the audience to go through HRCB reports to get a detailed and unbiased view of the massive violations taking place in Balochistan today. He said that whosoever opposed or disagreed with the CPEC project in Balochistan was being picked up, tortured and killed. Balochistan is under siege, and media and Human Rights organizations are not allowed to enter Balochistan. People who live outside Balochistan and speak for Baloch human rights are also not safe. Sabeen Mahmood is one such example who was killed in Karachi because she dared to host a programme on Balochistan. Dr. Manan, a politician who raised concerns and opposed CPEC, was killed with one bullet in his head. The situation would worsen further of the world community did not react to such barbarity, he concluded. Jawad Baloch said that the situation in Balochistan was worsening day by day. There are ruthless and brutal military operations being conducted by the Pakistan army in all parts of Balochistan. Scores of people have been abducted. Houses are being burnt. Genocide of Baloch is taking place in the name of CPEC project. The lure of dollars being pumped into this project by China have made Pakistan determined enough to go ahead with the Baloch genocide to remove all trace of resistance to CPEC. They want to complete this project on the dead bodies and mass graves of the Baloch. The silence of the world has encouraged Pakistan to keep committing human rights violations in the name of eliminating anti-national elements. Niaz Baloch stated that throughout history the youth and the students had always fought injustice and oppression and sacrificed their lives for the sake liberty and independence. The Baloch people CPEC project is an exploitation project even worse than the ongoing projects with Chinese investments in Saindak and Rekodik. The CPEC is a move to further strengthen the process of colonization of the whole of Balochistan. All areas that are on the CPEC route are under heavy military control. Several areas have been handed over to the death squad groups raised by the military to kill the Baloch people. Balochistan has been transformed into a large military garrison. He appealed to the international human rights activist and media persons to visit Balochistan and show the real picture of Balochistan to the world. There was a consensus among the participants that the CPEC was more strategic than economic as far as its objectives were concerned. The participants agreed that it might push Pakistan into a debt trap and turn it into a colony of China and exacerbate the regional geopolitical tension contributing to the security concerns of other neighbouring states. China’s control of Gwadar and economic resources of Balochistan was detrimental to the interests of the Baloch people who were likely to come under two colonial masters instead of one. The determination of Pakistani military to execute CPEC by all means would result in eventual liquidation of the people of Balochistan, which was a grave challenge for human rights advocates all over the world. The participants appealed to all concerned to keep a closer tab on the developments on the ground in Balochistan, as the CPEC was being implemented, and generate pressure on Pakistan to stop atrocities on the people of Balochistan in the name of bringing economic prosperity with Chinese help to Pakistan.